Asus announced a successor to the ZenBook Pro UX501 at Computex in May. 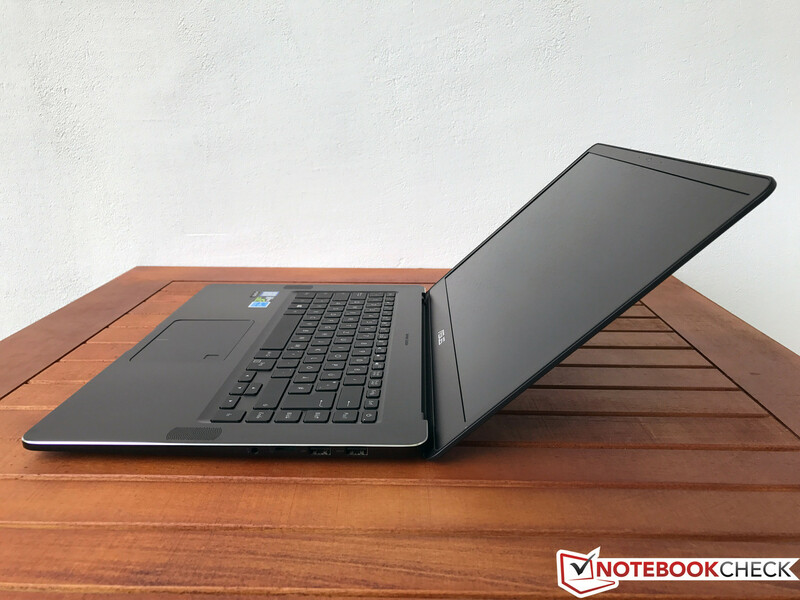 The UX501 has been available for more than two years and got a Skylake Update in 2016. 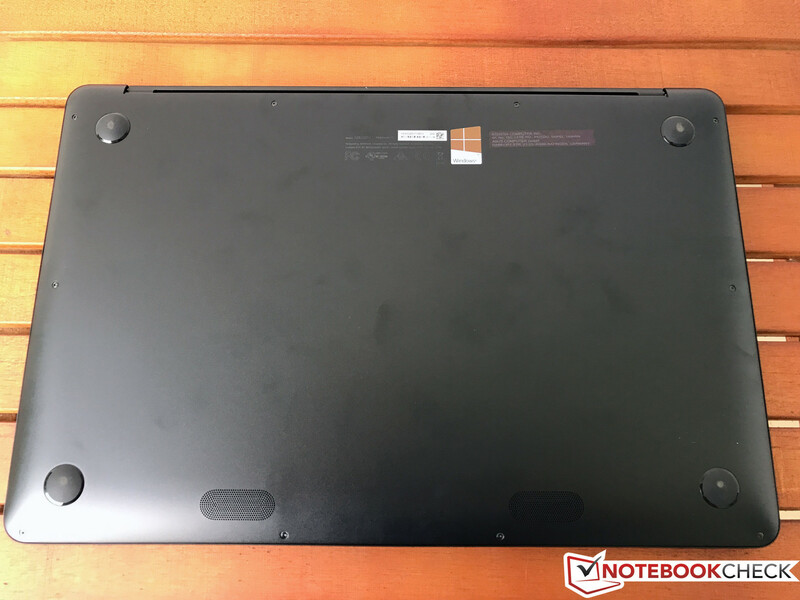 The new notebook is called ZenBook Pro UX550 and has a so-called "Nano-Edge display", which means that the bezels are very slim, so the 15.6-inch screen fits into a 14-inch chassis. Asus has decided to implement powerful components, including the popular Intel Core i7-7700HQ quad-core processor and modern GTX 1050 GPU from Nvidia. The UX550 was originally announced with the more powerful GTX 1050 Ti as well, but it is not available in all regions. Our test model is equipped with the standard Full HD IPS panel, while a 4K screen is optional. 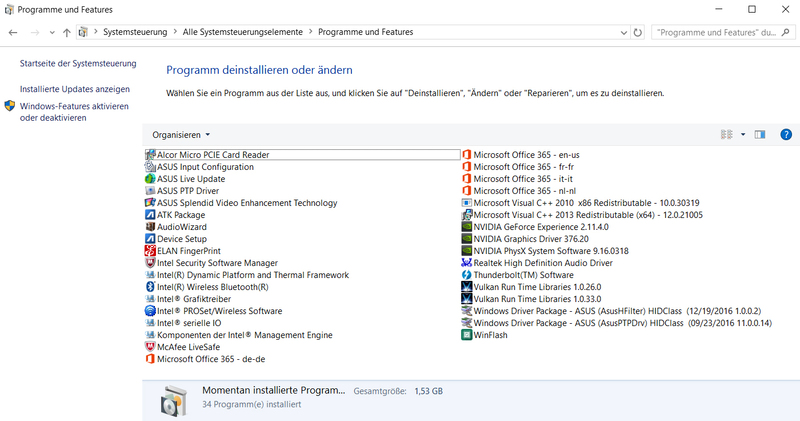 The memory and storage equipment is not bad with 16 GB of RAM and a 512 GB PCIe-SSD. 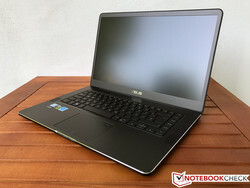 Our laptop retails for around 1800 Euros (~$2150). One of the biggest rivals is definitely the Dell XPS 15, which uses very similar components and slim bezels. We will list both tested SKUs (Core i7 & UHD; Core i5 & Full HD) in the comparison tables. Another competitor with a higher price tag is from Apple: The MacBook Pro 15 that has recently been renewed with Kaby Lake CPUs and is still very popular. 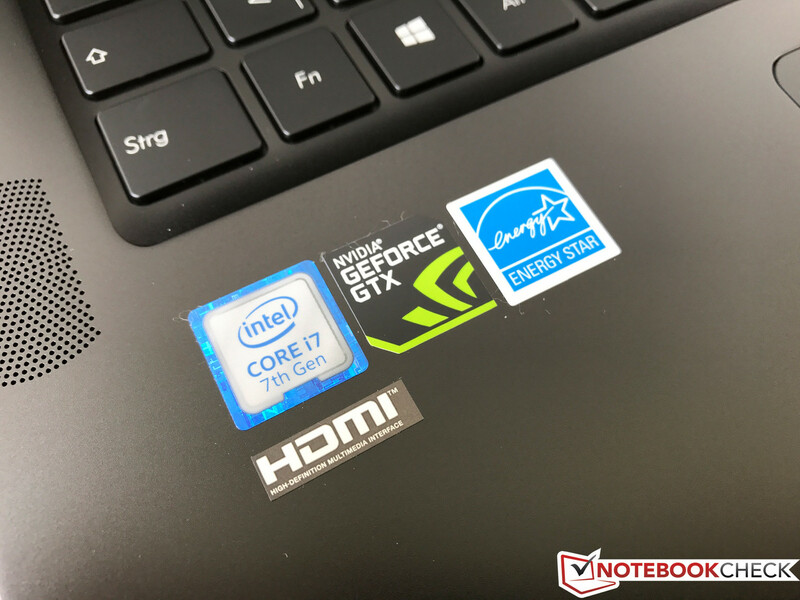 Another possible comparison device is the Gigabyte Aero 15, which is categorized as a gaming laptop thanks to the GTX 1060, but it also works well as a multimedia laptop. Finally, we will obviously check whether users of the old ZenBook Pro UX501 should switch as well. Update 08/31: Case, PWM & response times, PCMarks, GPU, temperatures Witcher 3, battery runtime. Update 09/14: Ports & communication, input devices, viewing angles, gaming performance, system noise, speakers, power consumption. 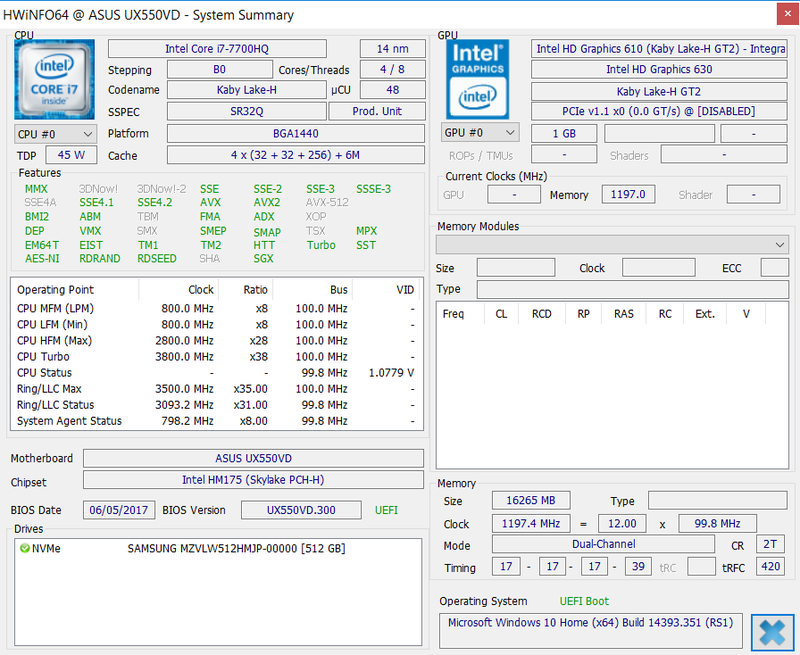 Update 09/26: The second test sample from Asus was a less powerful SKU with a Core i5-7300HQ and 512 GB SATA-3 storage. We added text segments in the corresponding review sections Storage Devices, Stress Test, and System Noise. The chassis of the new ZenBook Pro UX550 is created from a single piece of aluminum. Asus advertises 40 manufacturing steps, including the polishing for the iconic design with the concentric circles on the lid. The top edge of the base unit is also polished, which creates a very nice contrast to the otherwise matte black chassis. The other two visual accents are the Asus logos underneath the screen and on the lid. The latter is translucent and will light up when the system is turned on. The polished edge is also comfortable for the wrists. The bottom is slightly rounded as well and the overall handling is very good. The only problem with our black model is the susceptibility to fingerprints. You will have to clean it a lot (an appropriate cloth is not provided). We can imagine the optional blue model (Royal Blue) is more convenient in this respect. The stability, however, cannot fully meet the high expectations. The base unit is very sturdy at the palm rests and the sides of the keyboard, but this changes towards the center. Even medium pressure is sufficient to dent the surface. You can also dent the bottom panel at this spot and you can hear it has contact with the surface below. It is possible to remove the whole bottom panel for maintenance purposes, but more on that later. The notebook stands very well on the desk thanks to four large rubberized support feet. The display hinge is very firm and it is hard to open with just one hand. There is a small indentation with two status lights on the front edge, which are easy to see both when the lid is open and closed. The firm hinge prevents bouncing very well and the maximum opening angle is ~140 degrees, which should be sufficient in practice. The thin lid is surprisingly sturdy. You can dent or twist it with a lot of pressure, but there are no picture distortions and the whole construction leaves a good impression in practice. 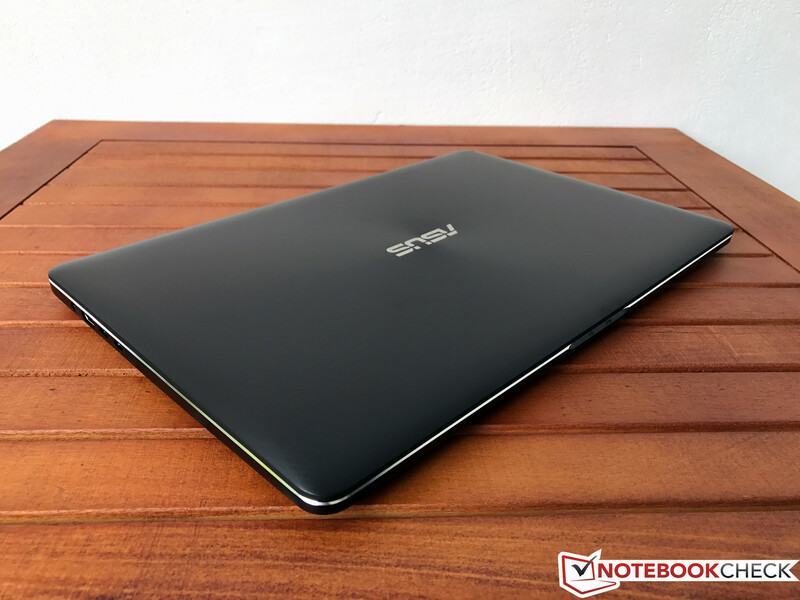 All in all, the new Asus ZenBook Pro UX550 is a very elegant and stylish device. We did not find any flaws with the build quality, but the aluminum case from Apple still has the edge in terms of the stability. 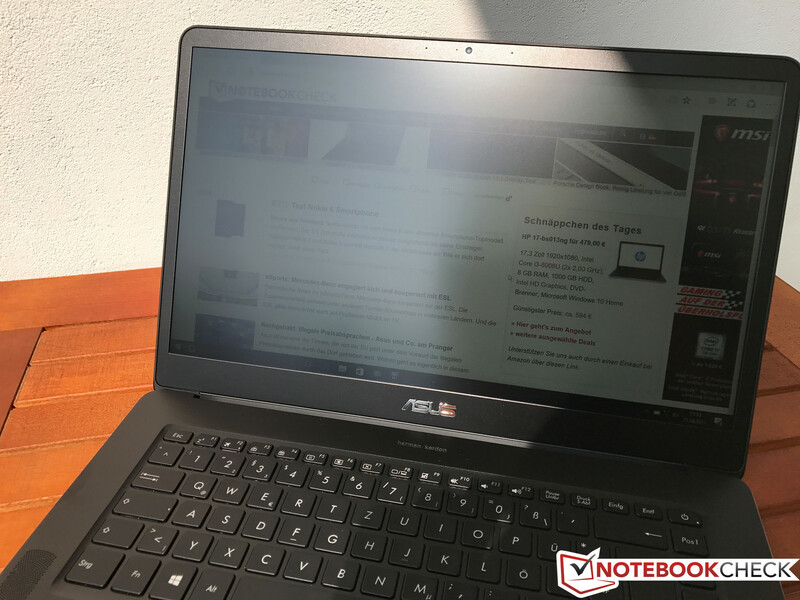 Asus can use a smaller chassis thanks to slimmer bezels, which is clearly evident compared to the old ZenBook Pro UX501. However, the rivals can do this as well, and the new UX550 is actually (slightly) beaten by the comparison devices in terms of footprint. Only the MacBook Pro 15 is lighter, but you also have to consider the bulky power adapter (580 grams/~1.3 lb) in addition to the 1853 grams (~4 lb) of the laptop – the travel weight is therefore basically on par with the other Windows rivals. The ports are located at the rear half of both sides. Asus uses a combination of new and old standards. 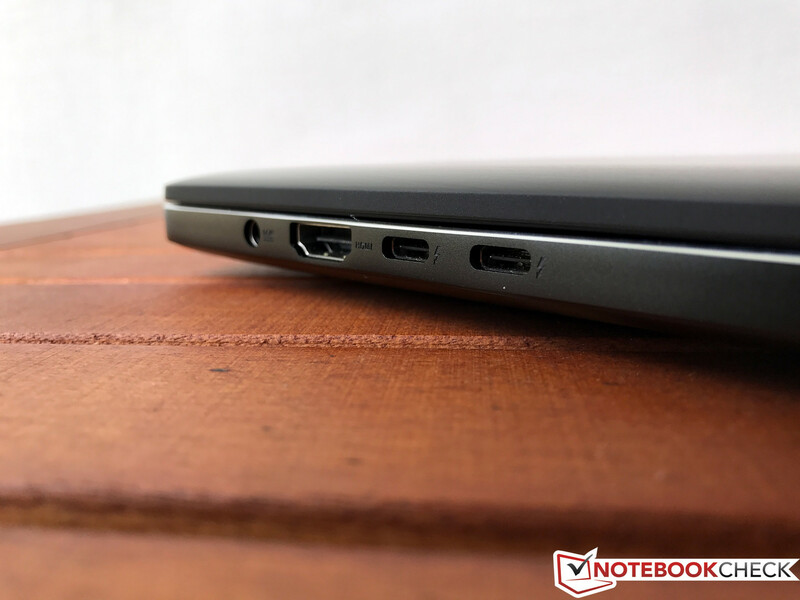 You get two regular USB 3.0 ports (maximum transfer rate: ~380 MB/s with Samsung SSD T3) as well as two modern Thunderbolt 3 ports with a USB Type-C connector (Gen.2). We cannot say whether the two ports are attached with the full bandwidth or not. Picture output as well as network functionality via adapter is supported, but the two ports cannot be used to charge the internal battery. The general layout is okay, but we would have liked to see a regular USB-A port on the left side as well. The slot for the microSD-card is located at the right side. We can measure an average transfer rate of 77.4 MB/s when we copy pictures from our Toshiba reference card (Exceria Pro M501). However, the tool AS SSD repeatedly stopped the test, so we cannot give you a maximum result. An Ethernet connector is not available, so you are limited to wireless networks. Asus has implemented Intel's current 8265 module, which supports all important standards in 2.4 and 5 GHz networks as well Bluetooth 4.2. Our standardized test with the router Linksys EA8500 (1 meter/~3 ft away) determines comparatively low transfer rates for this module compared to the rivals. However, we did not experience any connectivity issues in practice and even large downloads were no problem. You also get a webcam in the upper screen bezel, but we do not understand why Asus uses a VGA webcam with just 640x480 pixels in 2017. The pictures are extremely blurry and noisy. You can recognize the other person in Skype video chats, for example, but that is it. The scope of delivery is comparatively generous. 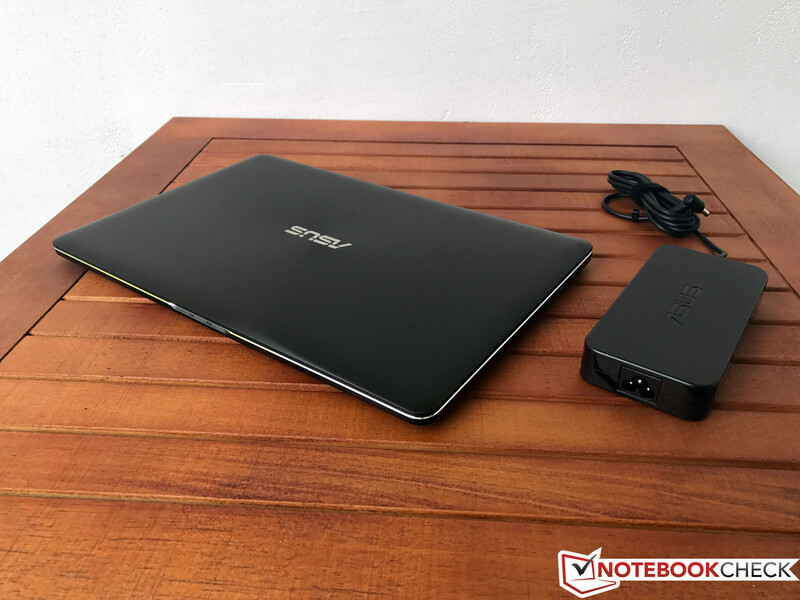 The box includes the ZenBook Pro UX550 with the corresponding 120-watt power adapter and some service brochures, but also a cable tie and a black laptop bag. You also get the usual software additions such as Office and McAfee trials as well as some tools from Asus, but overall, the manufacturer is very restrained. The box also includes a promotion for McAfee, which reduces the price for a 1-year subscription for 31.95 instead of 89.95 Euros (~$38 instead of ~$107). The bottom panel is secured by 10 Torx screws (T5). There are no additional hidden screws or plastic hooks, so the dismantling is easy. However, there is not much to do once you are inside, because you can only access the M.2-SSD (2280, PCIe x4), the Wi-Fi module, the CMOS battery, and the two fans. The RAM as well as the two processors are soldered onto the motherboard. Asus offers a two-year warranty for the ZenBook Pro UX550 in Germany, which includes a Pick-up & Return service. The battery is covered for only 12 months. Please see our Guarantees, Return policies and Warranties FAQ for country-specific information. Asus has implemented a black chiclet keyboard with white letters, which results in a good contrast. You can also use a white background illumination with three intensity levels in darker environments. The function keys are smaller, despite the large base unit, which is unfortunately also the case for the arrow keys. On the right side is an additional column for special keys such as Page Up/Page Down, so you will have to get used to the layout. The keys have a rather shallow travel of 1.5 mm (~0.02 in), but the keystroke is very even and the feedback is okay as well. There are certainly better inputs for frequent writers, but the keyboard is perfectly fine for daily stuff such as writing mails. We have already mentioned that the central keyboard area can be depressed under pressure, but this was no problem for us during typing. The mouse replacement is a ClickPad with integrated buttons. You can push the lower half of the pad down, but this results in a rather loud clicking sound. We preferred tap to click, and there is no clatter. 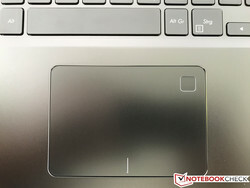 It is a Precision touchpad (gestures with up to four fingers), so the inputs are executed by Windows directly. Fingers glide easily across the surface and problems with a jumping cursor were rare during our review period. The size of the touchpad is sufficient at 10.5 x 7.5 cm (~4.1 x ~3 in), but there would have been space for a larger module. You also have the touch-style fingerprint scanner in the upper right corner, which does not register cursor movements. It could have been further towards the edge. 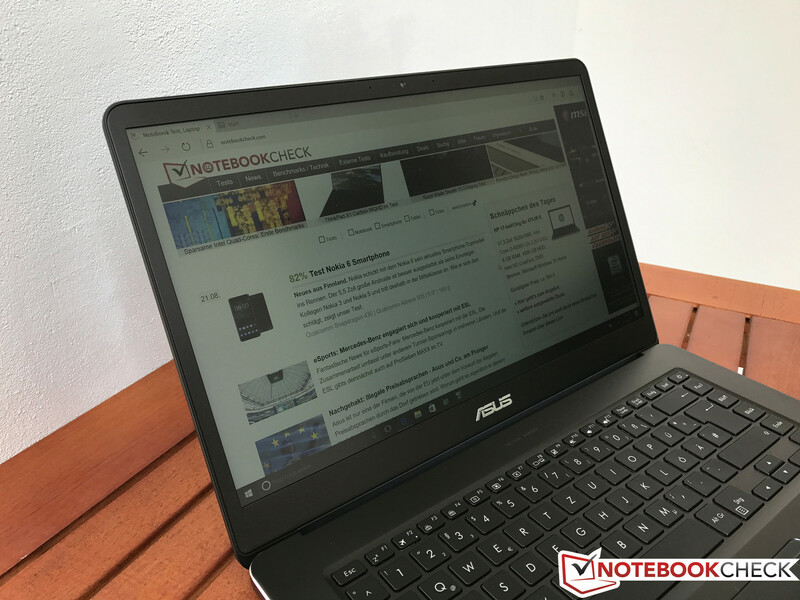 Asus ships the ZenBook Pro UX550 with either a 4K screen (touch optional) or the Full HD display, which is also the display of our test unit. 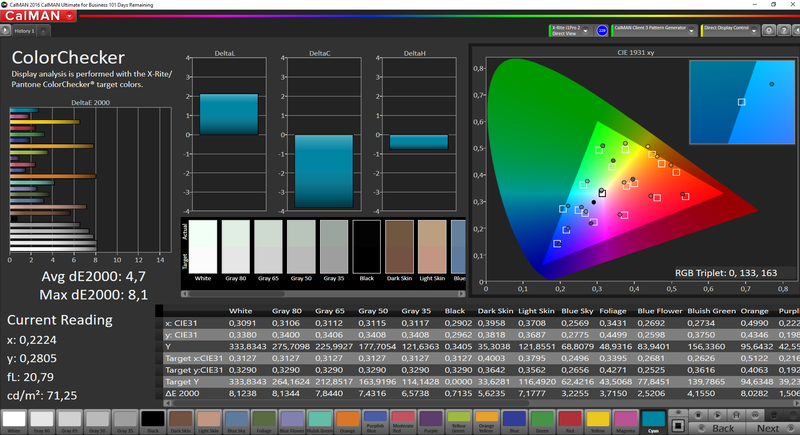 Besides the higher resolution (3840x2160 pixels), the manufacturer also advertises full sRGB gamut for the UHD panel. However, there are no specifications for the FHD screen. Both panels are based on the IPS technology. 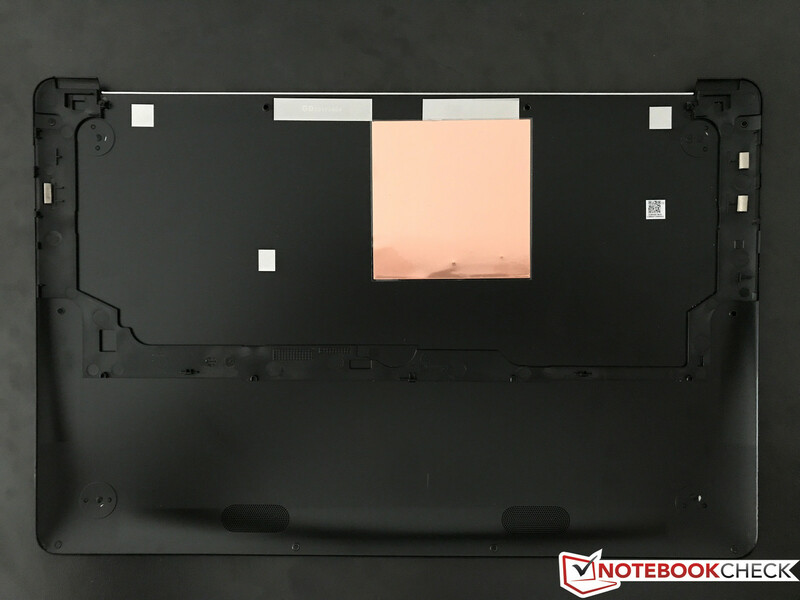 Our test model is equipped with the ChiMei panel N156HCE-EN1, which is very similar to the panel of the Gigabyte Aero 15. 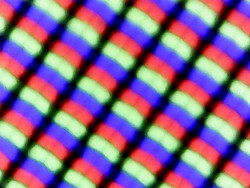 The resolution results in a pixel density of 141 PPI on the 15.6-inch screen. This is not a lot in times of high-resolution 4K screens, but you do not have to worry about blurry pictures. It certainly depends on whether you are already used to higher PPI numbers, but the subjective picture impression is generally good. The FHD resolution also has some advantages, because there are no scaling issues and the power consumption is usually lower as well. We use the spectrophotometer X-Rite i1Pro2 in combination with the professional software CalMAN for further measurements. 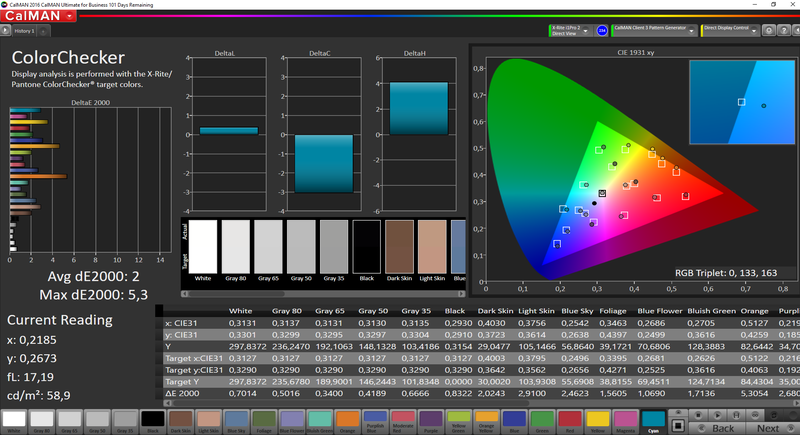 The average luminance is decent at 313 nits, but the brightness distribution is just average at 83%. The black value (how bright are black pixels) is 0.27 cd/m², which is a decent value for an IPS panel and also surpasses most of the rivals. Only some TN panels and OLED screens are superior in this respect. Luminance and black value result in a contrast ratio of 1241:1, which ensures a vivid picture impression. 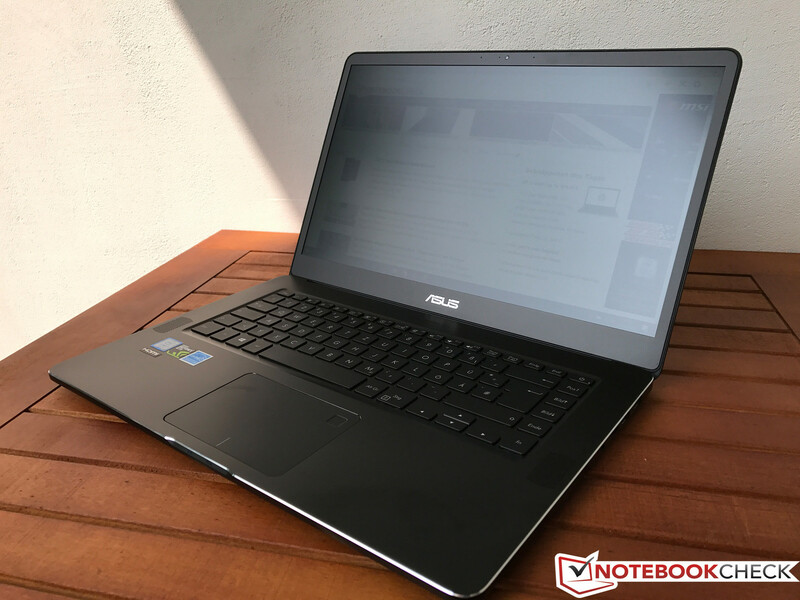 The Asus ZenBook Pro is once again among the best devices in the comparison group, only the FHD panel of the Dell XPS 15 manages a better value thanks to the higher luminance. Asus does not install a calibrated profile or a tool to adjust the colors. We can notice a slight green cast ex-works, but this is hard to see with the naked eye. The average DeltaE-2000 deviations compared to the sRGB reference are 5.8 for the grayscale and 4.7 for the colors, respectively, and we can see the biggest deviations for yellow, orange, and brown colors. The human eye can detect deviations at a value of ~3 or more, so the target area is below that. The grayscale performance in particular benefits from our calibration. The deviations are within the target range, and the slight green cast is gone as well. We can also see an improvement in the color, but there are still big outliers for yellow & orange. This means that the screen just cannot display these colors more accurately, despite the successful calibration. Our calibrated .icm-profile is available for free in the display box above. The color deviations increase at higher saturation levels, which indicated an incomplete sRGB gamut. 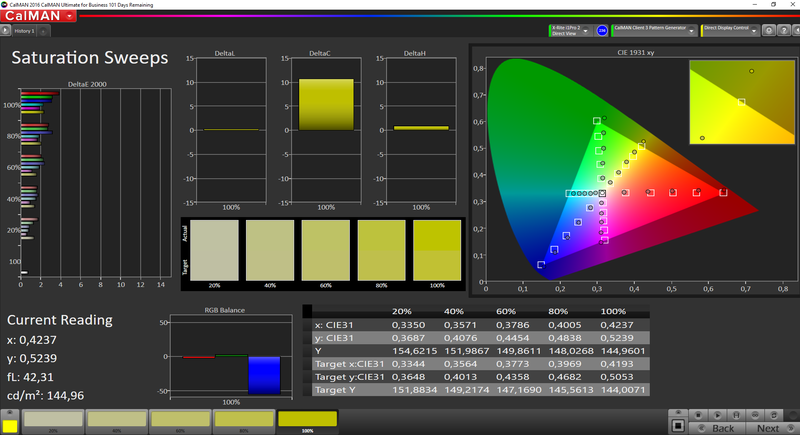 We measure 90% sRGB and 58% AdobeRGB. 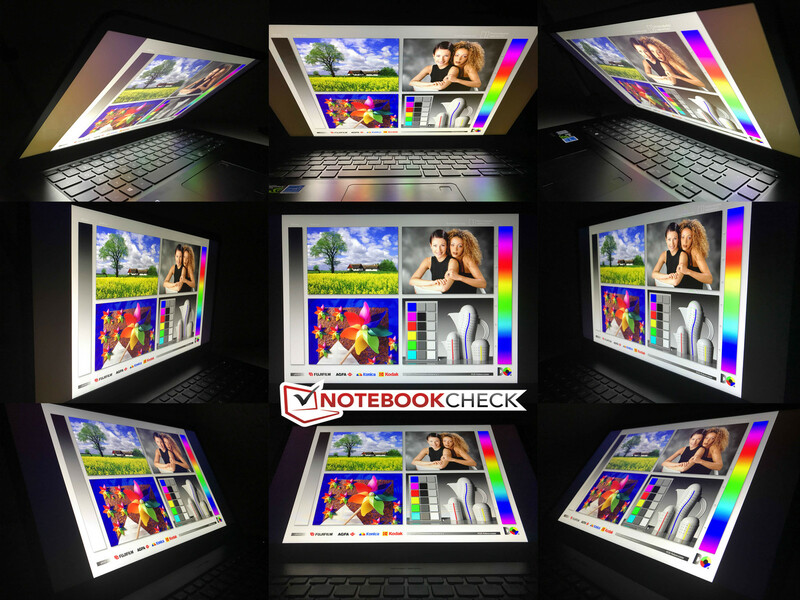 This – in combination with the color deviations – is not sufficient for professional users, but some light editing of your holiday pictures is no problem. The high-resolution 4K UHD panel is supposed to provide a full sRGB gamut according to Asus, but we cannot check the statement at this point. 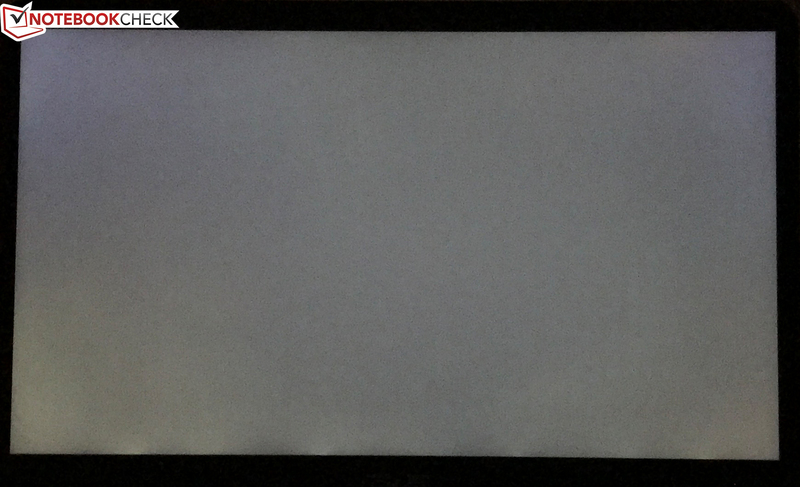 The display backlight flickers at 25910 Hz (Likely utilizing PWM) Flickering detected at a brightness setting of 20 % and below. There should be no flickering or PWM above this brightness setting. The frequency of 25910 Hz is quite high, so most users sensitive to PWM should not notice any flickering. You can use the full luminance on battery power and the matte panel surface is obviously an advantage outdoors. You can see the content very well even in bright environments when you adjust the display and avoid direct light sources. There is not much criticism for the viewing angles, either. You can always see a clear picture from every angle, only extreme angle from above will result in a slight yellow hue. However, this is not particularly important in practice. The Intel Core i7-7700HQ is a very popular processor for high-end multimedia and gaming laptops. Its four cores can run at up to 3.4 GHz under load via Turbo Boost (2cores: 3.6 GHz, 1 core: 3.8 GHz) and provides plenty of performance for any kind of application, which should not change over the next couple of years. The biggest difference compared to the optional Core i5-7300HQ (besides the higher clock) is Hyperthreading. It allows the Core i7-7700HQ to execute eight threads simultaneously, whereas the Core i5-7300HQ without Hyperthreading is limited to four. Otherwise however, the two 45-watt chips hardly differ since they are based on the same Kaby Lake architecture. 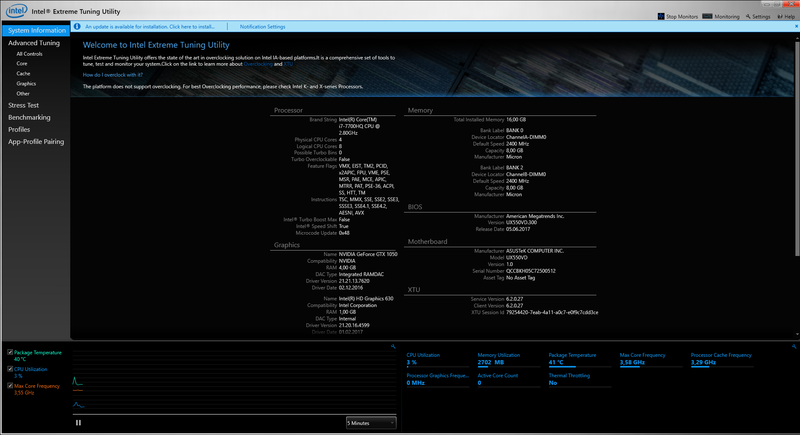 We refer to the dedicated CPU page of the i7-7700HQ as well as our Kaby Lake article for further technical information. Thanks to the higher clocks, the Core i7-7700HQ is obviously slightly faster than the Core i5-7300HQ, but you can only see a big advantage if the application can make use of the additional threads (8 vs. 4). A perfect scenario is the current Cinebench R15 Multi test, where the Core i7-7700HQ is 45% faster. 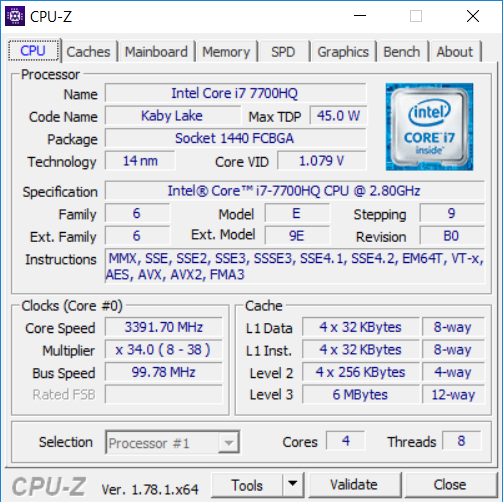 The old Core i7-6700HQ inside the previous ZenBook Pro UX501 on the other hand is just 11% slower, so the new processor does not justify the upgrade. 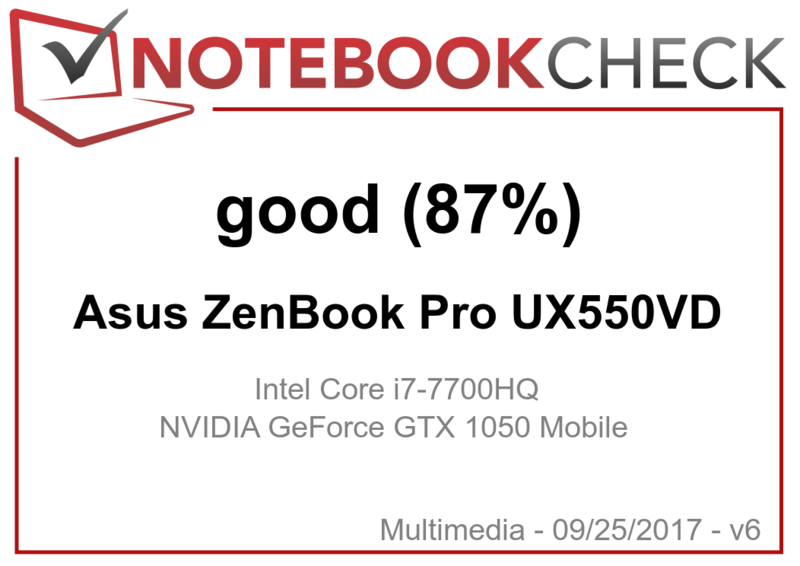 The ZenBook Pro UX550 performs very well in the benchmarks, which indicates an excellent Turbo utilization. The processor performance is not reduced on battery power. By the way, Asus has increased the short-term power limit for the processor; it can consume up to 60 W within the first 28 seconds. The usual 45 W limit is still active for longer periods to keep the temperatures in check. The CPU in our test sample consumes only 42 W (4x 3.4 GHz) in the Cinebench Multi test. Only extreme workload, which is the case with the tool Prime95, for instance, can increase the power consumption for short periods. But more on that later. It is always interesting to see whether slim notebooks with limited cooling capabilities can maintain the performance under sustained workloads. 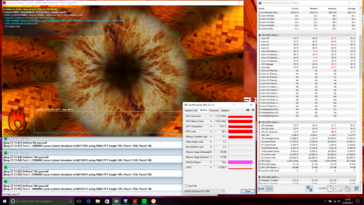 We run a loop of the Cinebench R15 Multi test and the result is very good, because the result is stable even after 30 iterations. You can use our comprehensive CPU benchmark list for more comparisons with other processors. 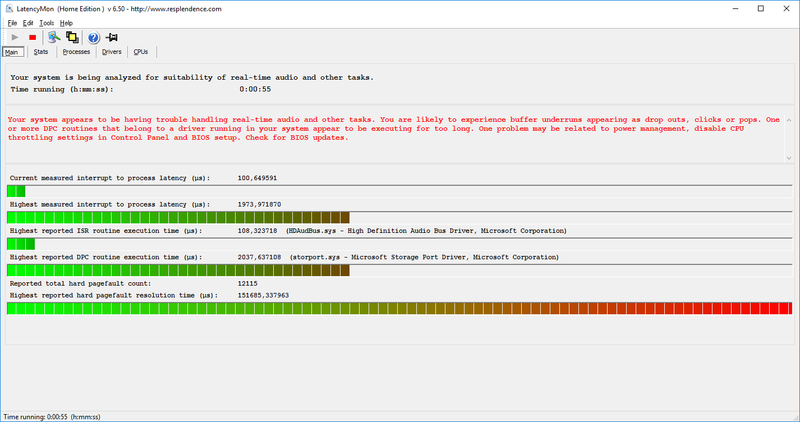 The subjective performance impression is very good thanks to the fast SSD and the powerful components, but we experienced multiple freezes within two days. The laptop stopped working two times during “Witcher 3” (both times after ~10 minutes) and once when we opened Microsoft's Edge browser. Only a long push on the power button would turn the device off. The first two issues appeared during the test with “Witcher 3”, so we suspected temperature issues at first, but this was not the case. Currently, we have no idea why it happened, but we will obviously observe the behavior over the next few days. The test model is equipped with the current BIOS (version 300). Update 09/14: We did not experience more freezes during our 3-week test period. We think this might have been caused by a driver issue (probably Intel Wi-Fi) after we talked to Asus, which was automatically fixed via Windows update. We will obviously check the second test model when we get it. Our subjective performance impression is supported by the synthetic PCMarks and the Asus is only beaten by the Gigabyte Aero 15 with the more powerful GTX 1060 GPU within our comparison group. 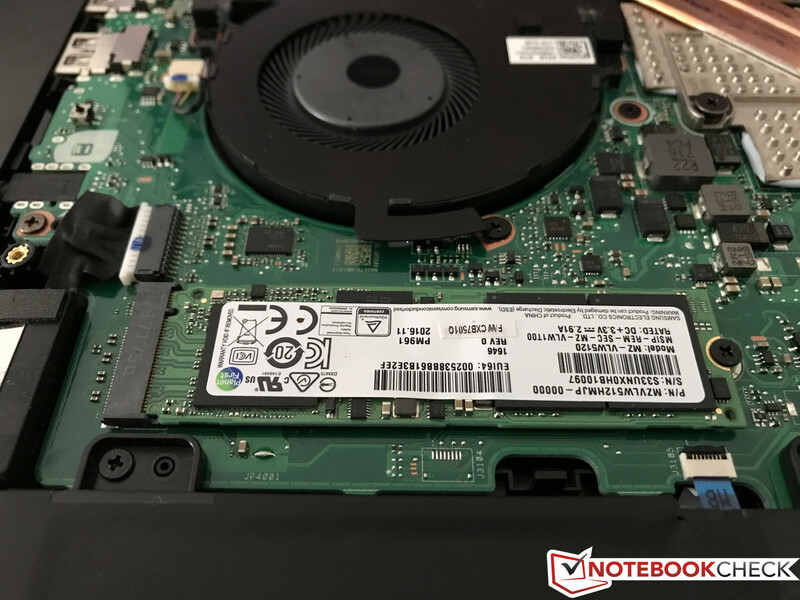 Asus does not make any compromises in terms of the SSD and ships the UX550 with a 512 GB PCIe x4 NVMe drive from Samsung. 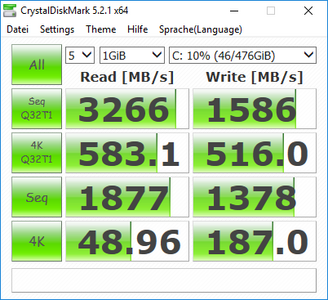 The PM961 is among the fastest drives on the market and manages sequential transfer rates of almost 3300 MB/s (read) and 1600 MB/s (write) respectively. You can clearly see the advantage over SATA drives, but they are much closer in the 4K tests, which are more important in practice. This means that you will usually not notice a big difference compared to SATA SSDs in practice. It is possible to replace the M.2-2280 SSD. However, since this is already a very fast drive, it would only make sense to replace it with a larger module. You can use our SSD/HDD list for comparisons with other hard drives. The second test sample is equipped with the Core i5 processor as well as a SATA-3 SSD. The latter is provided by Micron and the storage capacity is still 512 GB. 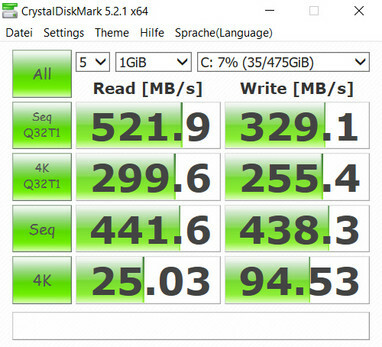 The benchmark results are good, but you can clearly see the SATA-3 limitation at around 550 MB/s. Still, there are no limitations in practice. We are not sure whether the faster PCIe-SSD is exclusive to the Core i7 SKUs. Simple tasks such as web browsing or video playback are handled by the integrated processor GPU HD Graphics 630 to save power. The Nvidia GeForce GTX 1050 automatically steps in when you start to stress the system. It is Nvidia's current mainstream GPU based on the Pascal architecture with 4 GB GDDR5-VRAM, and it is a good choice for a multimedia system. 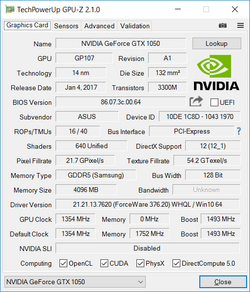 More technical information about the GTX 1050 is available here. The GTX 1050 in our test model is one of the slower models in the synthetic benchmarks. Dell's XPS 15 (+10%) manages a better 3DMark 11 GPU result and there is also a small advantage for the Dell (+6%) in the current 3DMark Fire Strike test. 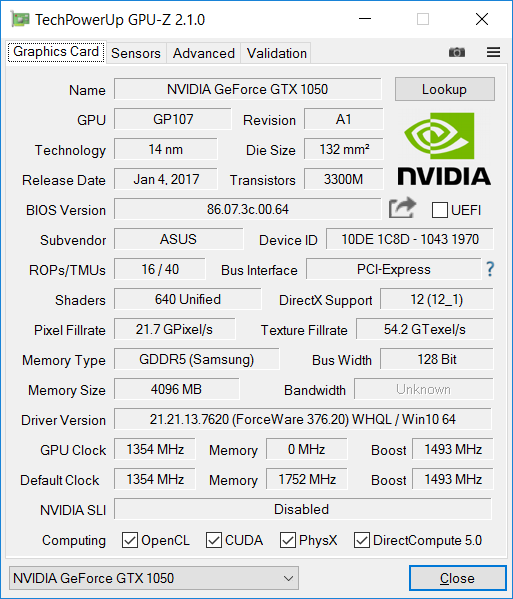 The GTX 1050 Ti, which is also available for the ZenBook Pro UX550, is about 30 to 40% faster depending on the test, while the GTX 1060 in the Aero 15 is sometimes more than twice as fast. 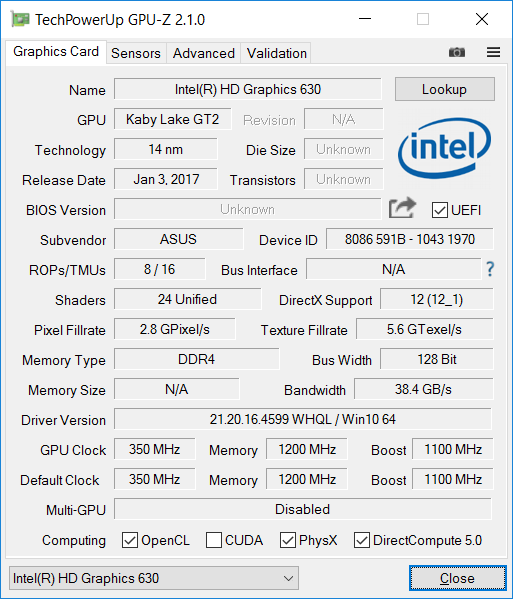 We saw that the new CPU hardly justifies the upgrade, but the old GTX 960M in the previous ZenBook Pro UX501 is clearly beaten. The new GTX 1050 is more than 40% faster in the Fire Strike test, which is a significant improvement. Unlike the processor performance, the GPU performance is slightly reduced on battery power (~10%). We will soon see that the CPU performance is limited when you also stress the graphics cards, since the cooling solution struggles with the heat development. We therefore checked how this affects the gaming performance. The positive result: Modern games in high details mainly depend on the graphics card and the CPU is not overly important. 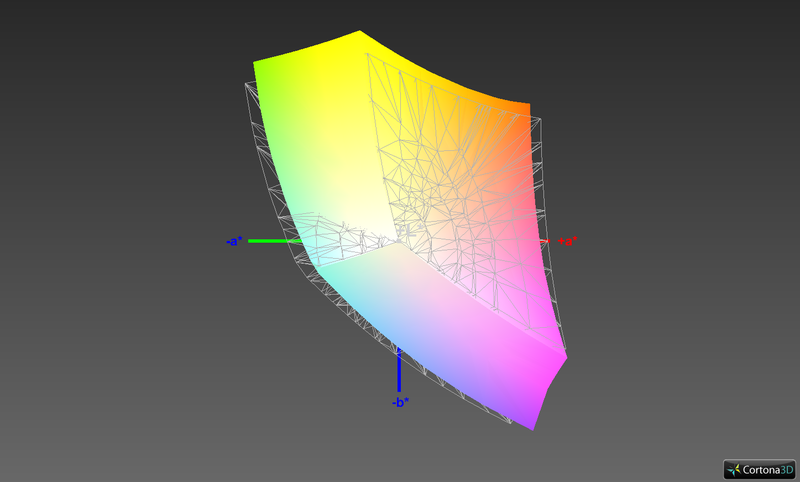 However, this changes when you reduce the settings/resolutions. We started our “Dirt 4” Benchmark and did not move the car on the track. The frame rate is between 200-210 FPS in the Low preset, which drops to ~175-180 FPS after one minute (CPU throttled to 15 W). The drop is smaller in the Medium preset from 92 to 85 FPS, but it is still there. 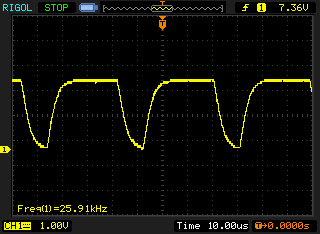 It does not change with the High preset. Witcher 3 shows a drop from 70 to 61-63 FPS in the Medium preset and we can still notice a drop with high settings from 39 to 35-36 FPS. This is currently not a huge issue, but the limitation will have a bigger impact in the future when games will have higher requirements. The results in the gaming benchmarks are usually at the lower end for a GTX 1050. You can still play almost all modern titles with high details in the native 1080p resolution. The optional GTX 1050 Ti should be another 30-40% faster. More gaming benchmarks are available in our tech section. The two fans of the ZenBook Pro UX550 are often deactivated or hardly audible while idling. However, it is still not a silent device since there are electronic sounds. 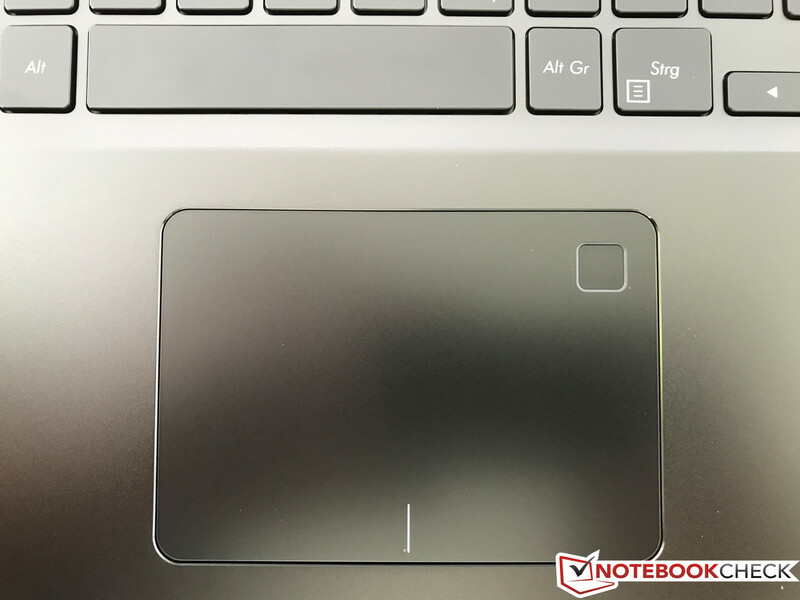 There are two different types: a quiet whining sound, which is unfortunately a problem for many current laptops, but there is also a louder and much more annoying electronic sound at around 30.5 dB(A) when you stress the notebook. The value itself is not very high, but it is a very high-pitched noise. We noticed it in benchmarks and also games, but not during everyday tasks such as web browsing or watching videos on YouTube. The fans can increase their speed seamlessly. They are unfortunately very sensitive to load changes, which is rather annoying. The fan murmur itself is no problem. The fan will reach 36.8 dB(A) and later 38.3 dB(A) with medium workloads (3DMark 06). Our stress test and the “Witcher 3” test result in 39.8 dB(A), so the cooling solution is quieter compared to the rivals. However, you also have to consider the reduced CPU performance, which is described in the next section. Update 09/26: The fan behavior did not change with the updated BIOS version 302, but the annoying electronic noise was not present. We believe the high-pitched sound is coming from the Samsung SSD inside the first test sample. The cooling system consists of two fans in the rear corners and two heat pipes covering the two processors in the center. The fans get fresh air from the side and dissipate the warm air at the rear, where it hits the lower screen bezel. You can easily see this on the infrared pictures further below. Besides the two hot spots at the lower bezel (left: 44.4 °C/~112 °F; right: 46 °C/~115 °F), there is just one more hot spot around the GPU, which is curious. The surfaces around the processor on the other hand stay conspicuously inconspicuous. We will later see that the processor throttles under load. The GPU reaches higher clocks in “Witcher 3” compared to the stress test (more details in the next section), so the surface temperatures are slightly higher. 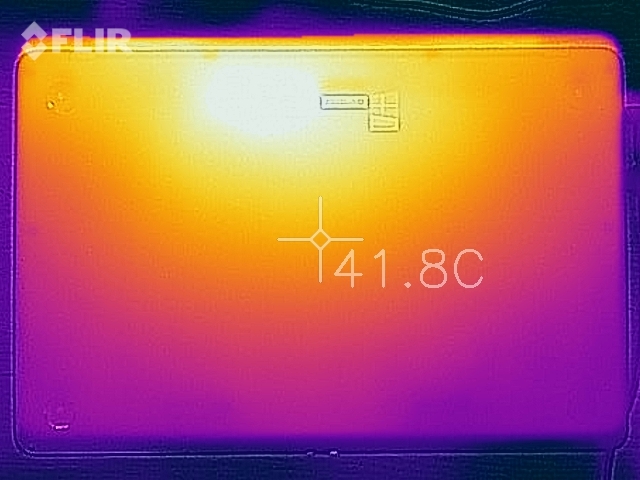 We can also measure higher temperatures for the two hot spots at the lower screen bezel during gaming (left: 45.6 °C/~114 °F, right: 48.6 °C/~119 °F). The palm rests stay very cool in practice and large parts of the keyboard do not warm up either. We can measure up to 44.7 °C (~112 °F) at the rear bottom though, so you should not use the system on your lap under load. However, there are no restrictions when you perform day-to-day tasks. The behavior of the UX550 in our stress test is very interesting, so we want to have a closer look at the results. 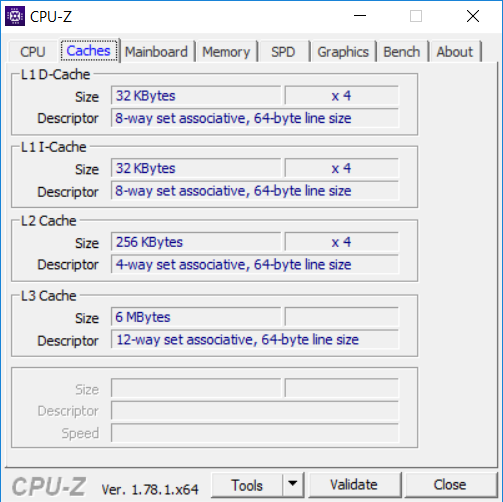 The new ZenBook Pro UX550 can handle CPU load, which is simulated by Prime95, very well. 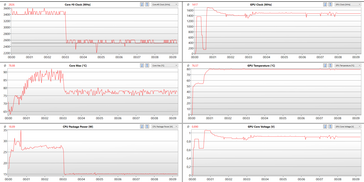 We can see the full 3.4 GHz at 60 W at first, but this results in CPU temperatures of 95 °C (~203 °F). 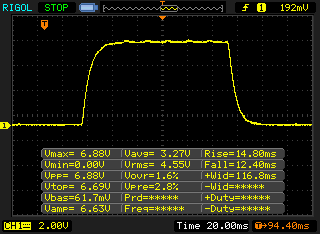 The usual 45 W limit sets in after about 15 seconds and the processor levels off at 2.9-3.0 GHz and 89-90 °C (~192-194 °F). 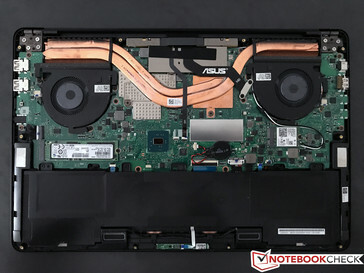 This means that the Asus can handle the heat from the processor at the specified (by Intel) 45 W.
The laptop starts to struggle when you stress the GPU at the same time. The processor will reach temperatures above 90 °C (~194 °F) and reduce the clock to 2.6-2.7 GHz (91°C/~196 °F @ 35-36 W). However, this level cannot be maintained for long because there is another significant drop after two minutes. The processor cores run at only 1.4 GHz and a consumption of 15 W (75 °C/~167 °F), so at just 1/3 of the specified 45 W. The GPU on the other hand is between 1300-1380 MHz at first and then levels off at 1150-1250 MHz after a while. 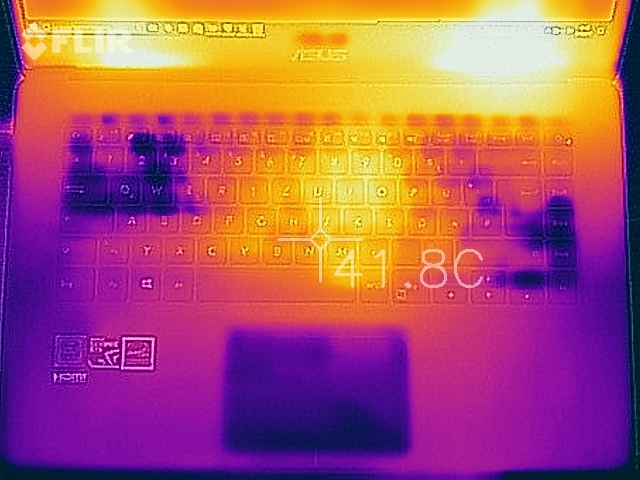 This is a result of the temperature target for the GPU at 80 °C (~176 °F). You can argue that the stress test is an extreme scenario and not really relevant in practice. However, we can also see this behavior while playing “The Witcher 3”. The analysis above clearly shows the CPU drop after just a couple of minutes, while the GPU has a bit more headroom and runs at 1400 MHz on average. Many modern games mostly benefit – especially at high settings – from powerful GPUs. This is also the case here (Witcher 3 Ultra), so the drop of the processor performance does not really affect the frame rates (minus 1-2 FPS). This is still an interesting aspect and we are already eager to review the recently announced quad-core ULVs. 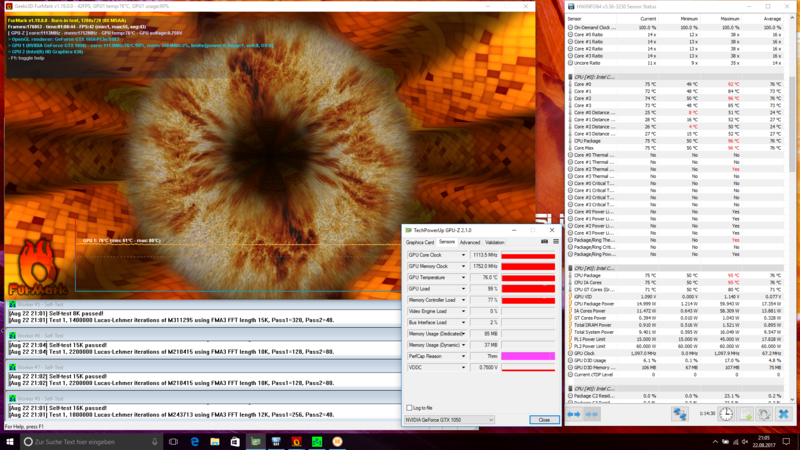 A 3DMark 11 run immediately after the stress test determines a 13% lower score (7757 vs. 6758 points), and the deficit is roughly similar for the CPU & GPU. This means that you cannot utilize the maximum performance immediately after heavy load periods. Update 09/26: The second test sample with the Core i5-7300HQ processor showed the same behavior under load. The TDP is limited to 15 Watt once the core temperature surpasses 90 °C. The sound system consists of four speakers certified by Harman Kardon. Two of them are located next to the keyboard, and the other two in the front of the bottom panel. We are positively surprised by the modules, because the sound is very spatial and rich when you watch music, play games, or even listen to music. Our subjective impression is supported by the measurements, where we can see very balanced medium and high tones. An even better result would require a dedicated subwoofer, since the quality suffers a bit in this respect. Still, the overall result is very good considering the compact size. This is also the case for the maximum volume at almost 82 dB(A). The chassis starts to reverberate a bit at higher volumes, but there is no static or the like. You can definitely enjoy a movie or a game with the integrated speakers, and an external solution is not necessary. The 3.5 mm jack provides a noise-free signal. The test model is very efficient while idling and consumes less power than the rivals. The impact of the keyboard illumination in the Idle max value is quite interesting. The result of 12.2 W includes the illumination at its highest level, but it drops to 9.7 W when we turn it off. 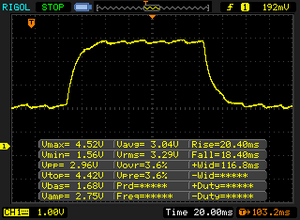 The load results also represent the respective maximum values before the CPU starts to throttle its performance. For example: The stress test value quickly drops from almost 120 W to ~82 W, which is also the level for “Witcher 3” after we can measure 93 W in the beginning. The provided 120 W PSU is just sufficient for the maximum consumption, but there are still no problems thanks to the performance throttling. However, Asus should ship the GTX 1050 Ti SKU with a more powerful unit (120 W would still be sufficient if the CPU throttling is by design). 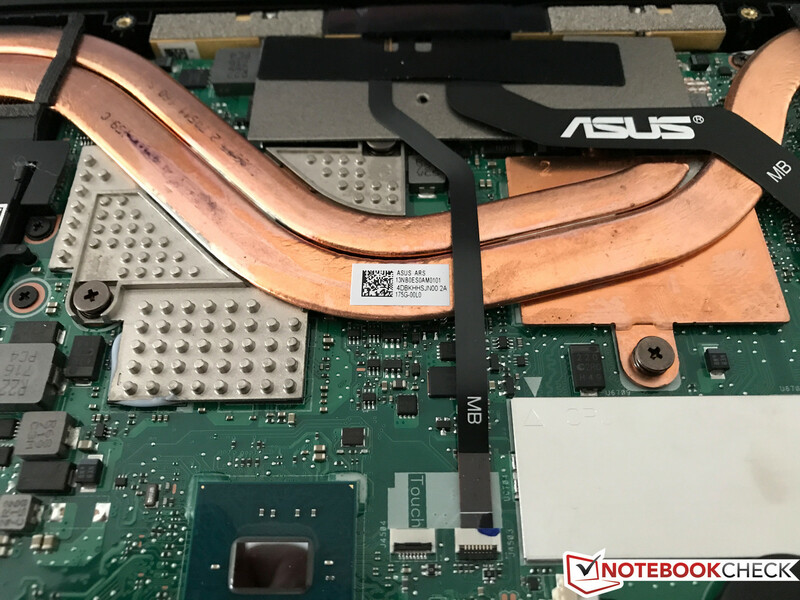 Asus has equipped the new ZenBook Pro UX550 with a 73 Wh lithium polymer battery (8 cells), which is not accessible from the outside. This is an average result within our comparison group since batteries with more than 90 Wh are not uncommon for 15-inch laptops. 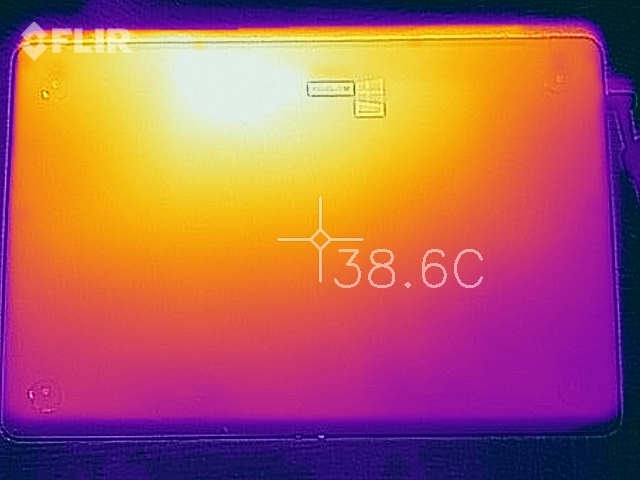 The laptop still performs very well in our first runtime tests. Our practical WLAN test at an adjusted luminance of ~150 nits (in this case 62%) runs for almost 9 hours. Only the MacBook Pro 15 lasts longer, but all the other rivals are beaten by quite a margin. The result in the video test is also good at almost 8 hours. The maximum runtime is even longer than 17 hours, but the minimum luminance is only usable in a dark environment. Our new “Witcher 3” runtime test is supposed to show how long you can play on the road. The result is little more than one hour, which is supported by the Battery Eater Classic test (70 minutes). A full charge of the battery takes 148 minutes when the device is turned on. Asus advertises that 60% of the capacity is ready after 49 minutes. The diagram actually shows that the charging speed is higher until the capacity reaches 65%, and we reached the advertised 60% after ~40 minutes; 95% after about 1.5 hours. There was no preloaded software on our model to adjust the charging limits. In review: Asus ZenBook Pro UX550VD. Test model courtesy of Campuspoint. 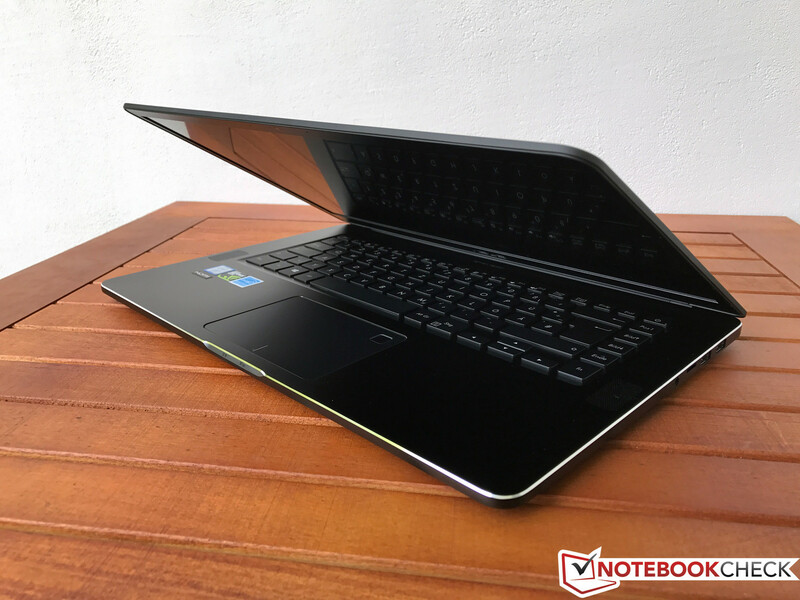 Our general impression of the new ZenBook Pro UX550 is good. There is no doubt that Asus offers an appealing multimedia laptop with a nice case, decent display, good stamina and powerful components. 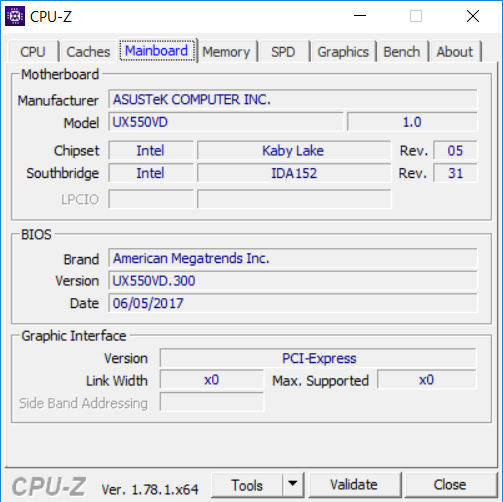 The raw CPU performance is very good and Asus can manage the heat development, but the systems starts to struggle as soon as you stress the GPU as well. This is not only the case in our stress test, but also when you play games. We were able to repeat this behavior with the second test sample, both with the old and the new BIOS version. However, the effect is fortunately pretty small when you play modern games at high details. It is a bit of a mixed bag since this might change in the future, and you also pay for a powerful processor, but cannot utilize its performance in practical scenarios. The fans quickly react to load changes, but are still conveniently quiet in practice. The electronic noises are more annoying in practice, especially in the case of the Samsung PCIe-SSD. We did not hear those very annoying sounds when we tested the second test model with the SATA-3 SSD. 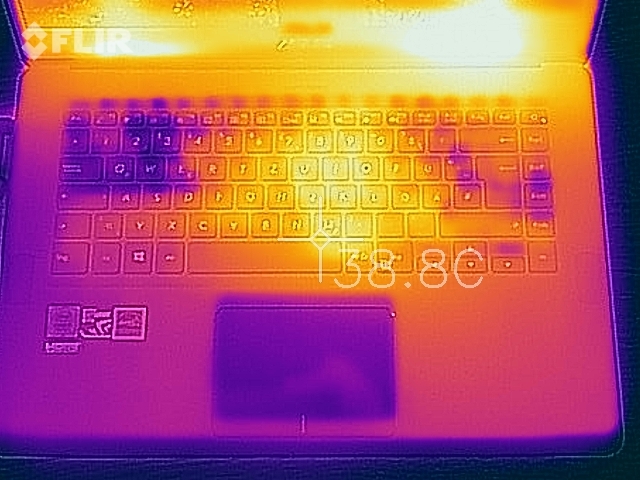 Good multimedia laptop, but weak cooling. 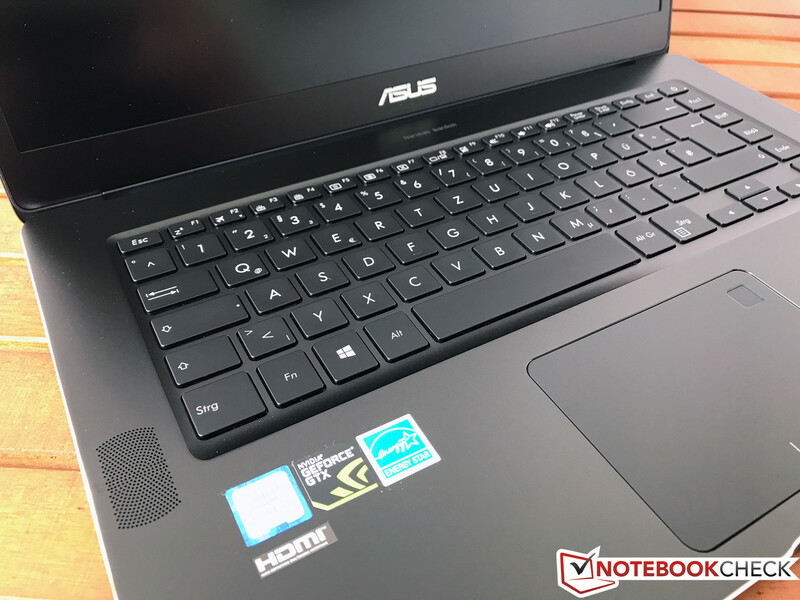 The Asus ZenBook Pro UX550 is a good choice if you are not looking for a gaming machine, but a good allrounder with a good screen, decent battery runtimes, and very good speakers. Otherwise, there are only small issues. In return you get a compact case, smooth operation, and a good screen (especially after calibration). Multimedia fans also get very decent speakers. The ZenBook Pro UX550 should be on your shortlist when gaming is not your primary usage scenario.